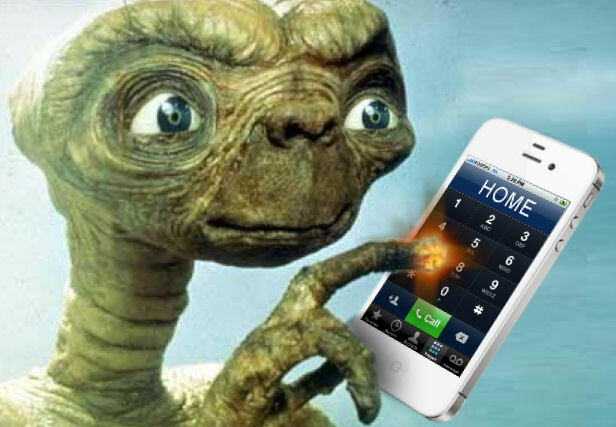 Image credit: George Lu / CC BY | NASA. As promised, this is a follow-up to my total solar eclipse adventure on (and around) August 21st 2017! You'll find my pre-eclipse thoughts and anticipations here. Miraculously, I have somehow managed to transform myself from a completely hopeless night owl to a semi-functional adult who's able to work a 9-to-5 job in the last month. This made the prospect of waking up at 6am on Saturday, August 19th to begin our 16+ hour drive down to Columbia, Missouri slightly less terrible. Epsilon got dropped off at a lovely dogsitter's home, because trapping her in the car for that much driving seemed like a bad idea. Yeah I did. Image credit: Z. Morris. I'm so pale, I only go outside during solar eclipses. Getting across the Canada-U.S. border was a breeze, we were extremely thankful for our NEXUS/Global Entry cards. Our two noteworthy stops along the way were on the shores of Lake Huron and Lake Michigan. My Bucket List just so happens to include "Take a dip in every Great Lake", and I'm happy to say I'm now 4 for 5! We'll have to wait and see how and when I manage to check "Chase a tornado" off the list. A funny thing happened on the way to Tennessee. We rolled into Columbia in the wee hours of the morning, extremely exhausted from the drive. (Full disclosure, my husband did the lion's share of the driving because he's awesome like that.) First thing we did was check the weather forecast for Monday, and it was not looking gOoOoOoOoOoOd lemme tell ya. We went to bed hoping for the best, but the forecast only got worst by the time we woke up on Sunday morning so we spent a few hours furiously trying to find a vacant hotel room eastward towards Tennessee. I got extremely lucky and grabbed what I can only assume was a last minute cancellation for a smoking room in Clarksville, Tennessee, just a handful of kilometres from the point of Greatest Eclipse! So we jumped back in the car and drove east for another 6 hours. This decision was a little difficult, in all honesty, since we were worried the amount of effort we were pouring into this venture would raise the stakes to impossibly high for the big event to feel like it was all "worth it". At this point we were all in though. It's RIDE OR DIE. RIDE AND DIE? What do they say in those Fast & Furious car movies? Pretty sure it's the first one. We finally arrived at the Kentucky/Tennessee border and set out to find our watching spot for the next day. We considered attending some of the events in Clarksville, or maybe even going to Hopkinsville, Kentucky aka Eclipseville, but after hearing that the little town of 25,000 was expecting over 200,000 people to descend upon it, we decided otherwise. We wanted our first eclipse experience to be a little more serene. We ended up finding an absolutely charming little park in Trenton, Kentucky, just 15 minutes North of our hotel and made sure to get there early enough in the morning to claim our spot. So I was pressing my eclipse viewer right onto my face. Was I not supposed to be doing that? It was a sweltering hot day, the humidex must've risen close to 40°C, but the heat was definitely starting to let up. Shadows started getting sharper, you could see individual hairs on your shadow's head. Then daylight got sort of dim. Not really.... like nighttime, though. The best way I can describe it is like wearing sunglasses you can't take off. We were just minutes away at this point. Everyone got on their feet with eyes (and eye protection) pointed to the sky. The light was fading fast now, the Sun was a only tiny sliver through our lenses. We must've lost 5, maybe 10°C since the start of it. We were all quiet, which made the sudden onslaught of cricket noise all the more surprising. Street lamps turned on, stars and planets starting appearing in the sky, everything around us felt topsy turvy. The last of the Sun's crescent disappeared, and our glasses came off. This is the most true-to-life image of the total solar eclipse I could find online. Just imagine the sky a little lighter, and the corona eerily waving around, and you're nearly there. Image credit: Conrad Pope. This... thing? It felt like I was witnessing something I wasn't supposed to see, that wasn't allowed to exist. Eclipse pictures don't quite convey the real life experience of seeing a total solar eclipse, because they're typically zoomed in on the eclipse itself with a black background. This was the real world all around me, the sky was an eerie blue grey, and there it was, the dang Sun... Except... not! It was this alien black star, a shimmering corona very softly flowing around it. And I was staring straight at it with my own two naked eyeballs. 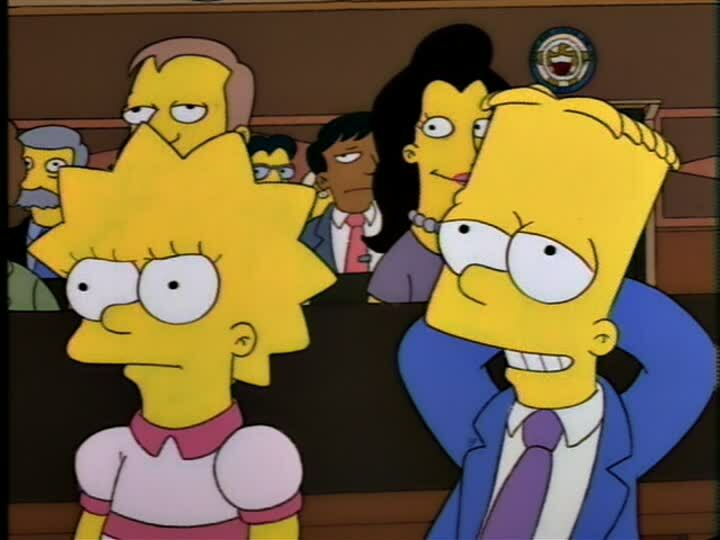 My husband was standing there with me, arms wrapped around me, and he saw the same thing I did with his eyeballs too! I felt goosebumps, tears slowly welling up in my eyes, and I couldn't even properly explain to you why! Truly, it was an emotional, spiritual, almost religious experience. Now, I had read lots of stuff about what seeing a total solar eclipse would be like to prepare myself, and I was very much excited, but I'll admit I was skeptical. It seemed like it just couldn't be as good as these people were describing. When I think back on my own totality experience, I wonder if I've imagined the whole thing. Was it just a fever dream?? If I had read my own description here a few weeks ago, I probably would've been like "Alright, relax lady, you're clearly exaggerating". You might be thinking exactly that right now, and I guess that's the gift and curse of the eclipse. I don't think you can properly describe the experience to someone who hasn't experienced it themselves, but that will hopefully force them to find their way to a total eclipse one day, just to see if all the hype is justified. And I hope you find your way to one if you missed this year's, because then this whole mess I just wrote might make a little more sense. ...Until then! Ride or die. Wow now that sure is... a car! Let me tell you! (I don't know anything about cars.) 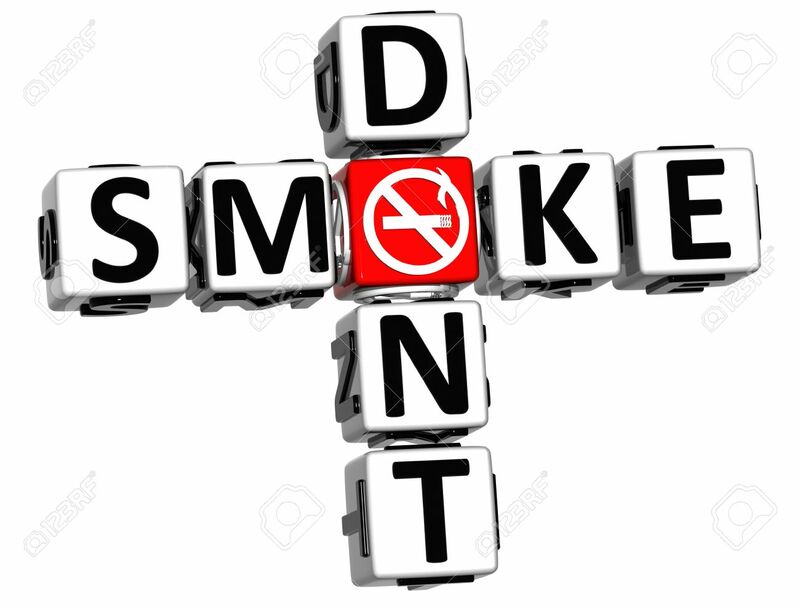 Image credit: Drive2.com. Hello everyone! The first thought I'd like to share with you is "wow, Mitsubishi made a car named the Eclipse Panda??". I'm not totally sure if the model of the car was "Eclipse" and they made some black and white version they called "Panda" because of the colouring or what, I'll admit my knowledge of cars is severely lacking. 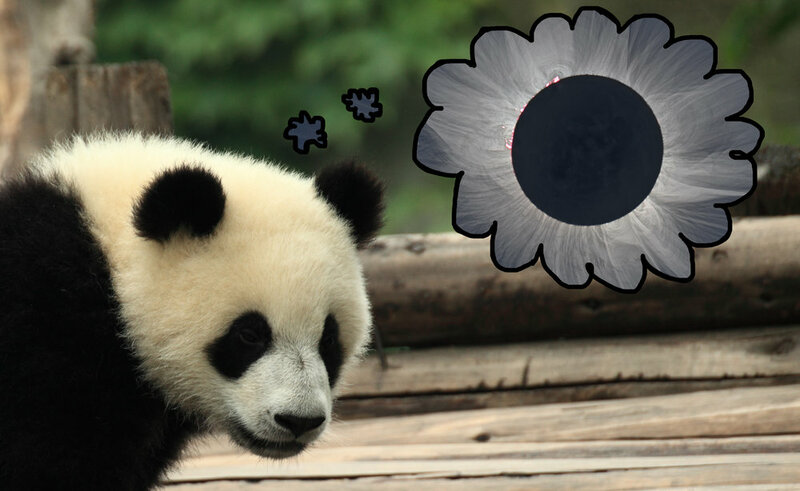 But it was still a cool thing to learn while Googling "panda eclipse" for pictures to insert in this post! The 2017 solar eclipse is quickly approaching, and I'm sure most of you are at the very least aware and more likely very excited!!! My earliest memory of a solar eclipse was the May 10th annular solar eclipse that passed over nearly all of North America. I was in 1st grade and clearly remember building a little pinhole camera in class in preparation. Even then, 6 year old Nathalie knew she was witnessing a momentous occasion. 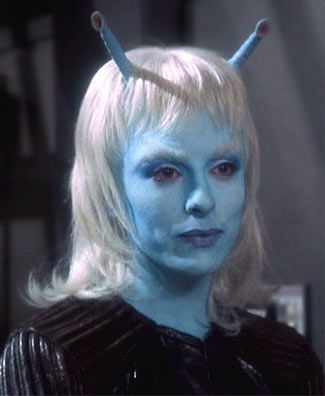 To think that right there, before her very eyes, she could see proof of the motion and alignment of celestial objects much too large and distant for her to comprehend... I mean how amazing and simply awe-inspiring is that?? The answer is "very". 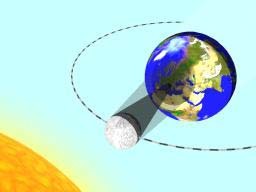 The 1994 eclipse was what we call an 'annular' eclipse, meaning that the geometry of the Earth-Moon-Sun alignment wasn't quite right for the Moon to fully cover the Sun during the eclipse. Instead of full coverage, you end up with a ring of fire still visible around the Moon. The precise geometry involved in solar eclipses is actually quite astounding, The diameter of the Moon is about 400 times smaller than the Sun's. 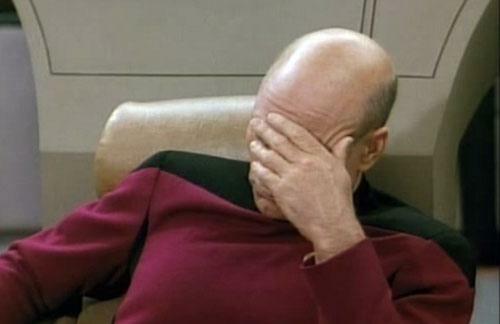 Buuuutttttt, amazingly, the Moon is also 400 times closer to Earth than the Sun! This means that the Sun and Moon look pretty much the same size in our sky! When they are perfectly aligned, BINGO! DINO DNA! I mean, SOLAR ECLIPSE! What determines when we have an eclipse? NASA Goddard explains! But wait a second, what's going on, the Moon completes one full orbit around the Earth about every 28 dang days, why aren't we seeing solar eclipses all the hecking time?? Also what's this deal with sometimes eclipses being annular, or even partial (when the Moon crosses the Sun higher or lower than at centre, and so never fully covers it). What's going on, Nathalie?! Well, you see, the orbit of the Moon is not a perfect circle nor is the angle of the orbit perfectly aligned with a line drawn from the Earth to the Sun. The Moon is sometimes a little farther away from Earth along its orbit, meaning it appears smaller in the sky and can't cover the entire disc of the Sun. And sometimes, the height of the Moon along its orbit means its path doesn't cross exactly along the Sun's centre, so it swings over a little too high or too low. Everything needs to be just right for a total solar eclipse to occur, and lo and behold AUGUST 21st 2017's GOT IT ALL! 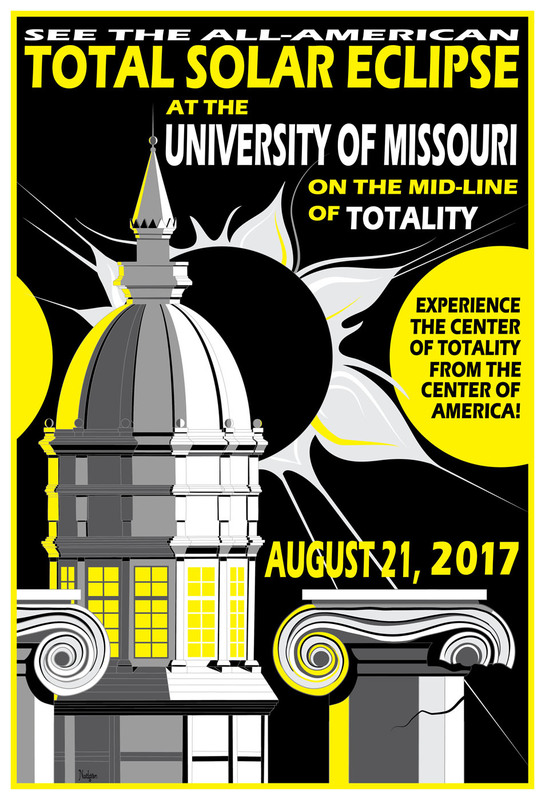 Tyler Nordren has made a suite of beautiful posters, including this Mizzou one, celebrating the 2017 solar eclipse across America! Get yours here! This is why my husband and I will be packing our bags and driving down 16 hours to Columbia, Missouri in the hopes of witnessing 2min37s of sweet sweet totality! 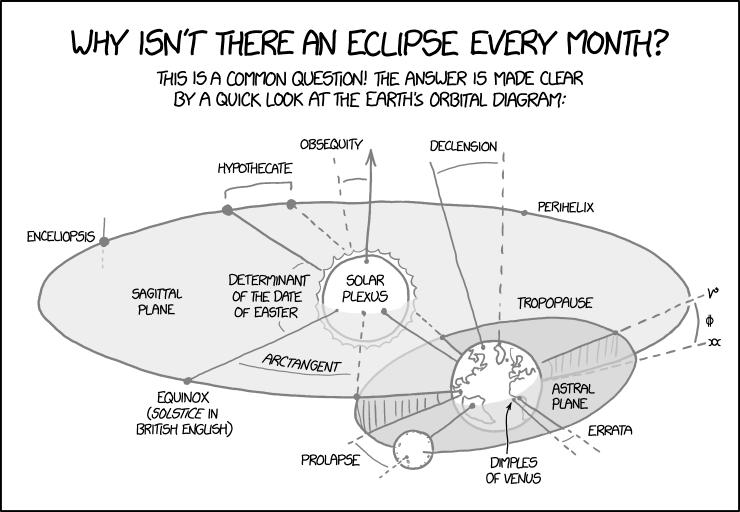 During a pre-interview with CBC News (and with this xkcd comic in mind), I was asked what this eclipse means to science and scientists. And sure, there's lots we can see about how the 1919 total solar eclipse allowed Sir Arthur Eddington to perform the first experimental test of Einstein's general theory of relativity. Or we could talk about how the Sun's corona usually gets totally lost in the glare of how bright the Sun's disc is, but having the Moon act like a coronograph means we can see all the magical and mystical wonders of the corona! But in the end, to me, it's about validating the years I've spent on a computer, solving equations, writing code, reading books on celestial objects. It's about reconnecting with my pure love of space, and remembering the wonders every one of us can witness with our own eyes. For that 2min37s, I hope to be that child again. 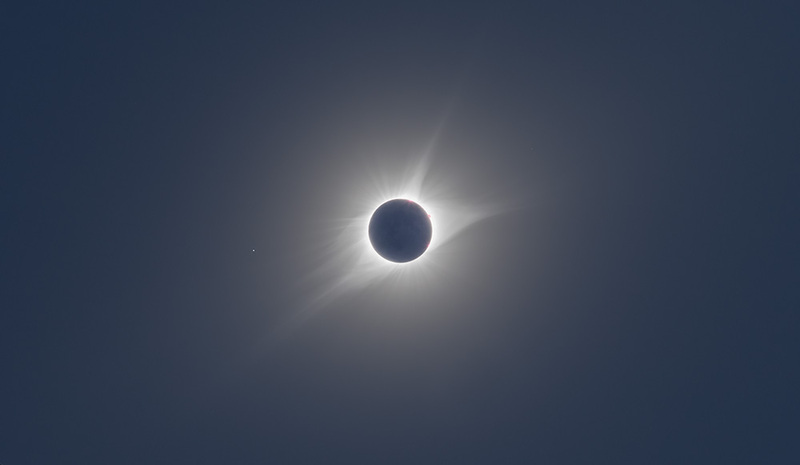 If you're still on the fence about whether you should try to see the total eclipse, read a little bit about how otherworldly the experience has been for people who have experienced it before! That totally convinced me, personally. Once the eclipse is over, I'll write a post-mortem about my experience. And I'm already getting excited about the April 8th 2024 eclipse that will be crossing the eastern side of North America! Good to know there's a backup in seven years, but seven years is a long time nowadays so I'm happy to take my chance on Missouri this year. I wish you good luck and clear skies! Don't stare directly at the Sun (except if you have good eclipse glasses, or are in the throes of totality), and stay frosty! 1) A series of two or more planets in near alignment in the sky may have been seen as a single very bright star. Using known planetary orbits, we are finding it difficult to find such an alignment to have occurred at the right time, unfortunately. 2) Some Chinese astronomers recorded a new star born from a supernova that was highly visible for 70 days in the constellation of Capricorn around 5 B.C. However, the religious scripts state that the Christmas Star moved from East to South over the course of many months, which cannot be so easily conciliated with a supernova progenitor. 3) A comet might have been the culprit, but they were typically seen as bad omens. Furthermore, we cannot find any other mention of such a noteworthy object in the literature. 4) Jupiter, a planet that can indeed be very bright in the sky, may have seemed near immobile due to it being at the end of one of its retrograde loops. The verdict is still out as to what the Star of Bethlehem truly was. Despite all our technological advances, it may be difficult to backtrack to a definitive answer so many years in the past. In Theaters All The Time (but also never IRL....). Image credit: N. Ouellette. nutshell, Pluto still does exist, it’s been downgraded to a “dwarf planet” and the goat lord Baphomet forbids me to speak of our dark secrets. But that’s not the point of today’s post. I was recently asked about Pluto possibly colliding with the planet Neptune and the ensuing mayhem it might cause. A sideview of Pluto's orbit (in red) shown to be highly inclined compared to the plane of the Solar System. Animation credit: Lookangmany. Neptune cross twice every cycle? Surprisingly, no! When Pluto’s orbit comes closest to the Sun and to Neptune’s orbit, it is also at its farthest point above Neptune’s path, which means the two planets always steer far clear of each other. The distance between the two at closest approach is 17 AU (the unit measuring one Earth-Sun distance). Pluto actually comes closer to Uranus at times, the shortest distance between the two being 11 AU! A view of Pluto's orbit (in red) from above, compared with Neptune's (blue planet). Animation credit: Lookangmany. Now, it is true that Pluto’s orbit is a little chaotic. Pluto is a very small body surrounded by lots of other objects, some of which are gas giant planets! So it is being pulled around quite a bit. One could argue that long term changes in Pluto’s orbit might one day bring it on a collision course with Neptune. Luckily, Pluto and Neptune are caught in a very precise 2:3 resonance with each other. This means that for every 2 full cycles Pluto goes through, Neptune will go through precisely 3 cycles. This is a very stable relationship between the two. If Pluto’s orbit were to change slightly in the future, so too would Neptune’s in order to respect the resonance. So the moral of this story is Pluto and Neptune are in a very healthy relationship in which they each respect the other’s space. We should all strive to be more like Pluto and Neptune.